Investors are increasingly looking for frontrunner companies that report transparently on material risks, but also on how these companies leverage opportunities in order to ensure and enhance long-term economic returns. Simple and relevant ESG information that they can trust and understand seems to be the single most effective recipe. A clear and up-to-date materiality matrix that is translated to business risks and opportunities can be a tremendous help in the process. Focused application of reporting frameworks such as GRI Standards or SASB can certainly help to provide information and KPIs that investors and other stakeholders can use to make organizations’ progress comparable. On the other hand, investor ratings and benchmarks like Dow Jones Sustainability Index and CDP emerged to find answers to specific standardized questions, and identify best-in-class performers. Despite increasing efforts for alignment, for instance through the connections between CDP and DJSI’s Climate Strategy chapter, the scattering of ESG ratings landscape can turn the answering of requests into a full-time job. Richness: Level of personalized feedback on performance: Gather insights on how feedback on company performance is provided once the questionnaires are processed. Do participating companies receive a scorecard or performance report based on their inputs, or do you only receive confirmation whether or not your company is included in a leadership index? Detailed feedback can be used by participating companies to plan interventions for improving performance and measure year-on-year improvement on these areas. Richness: Focus of the benchmark or ranking: An important aspect to consider is the focus of the benchmark. Is it focusing solely on a specific issue, or looking to assess the company’s sustainability performance as a proxy for financial success in the long term? And does the rating applies an industry-specific perspective, or do all companies jump through the same hoop? Reach: Initiator and target group: An important thing to consider is the initiator: who is asking the questions and for whom are the insights collected? Additionally, it is worth checking out the reputation of the requesting party. Meta-benchmarks such as SustainAbility’s Rate the Raters provide insight in the credibility of well-known raters. Asking your most important stakeholders, such as shareholders, directly which third-party sources they trust for valuable and objective information, is an efficient way to assess and determine your priorities. Reach: Public communication on results: Finally, it is worth noting how the rating agency communicates its results towards its direct customers and the greater public. Particularly when companies are looking for open recognition of their sustainability efforts from independent, credible third-party sources, levels of transparency on benchmark outcomes are an important criterion to take into account. While some rankings were designed to name and shame frontrunners and laggards in a top 100-list, others sometimes are not as visible – whether or not because of poor communication efforts, or whether the business model relies on consolidating and selling the data. Balancing richness and reach can help to select the most relevant ESG ratings that align with your objectives. Download our cheatsheet and start today to make your reporting calendar for 2019 more focused. Ready to make your reporting more RAPIDO? Don’t get stuck in the reporting trap. 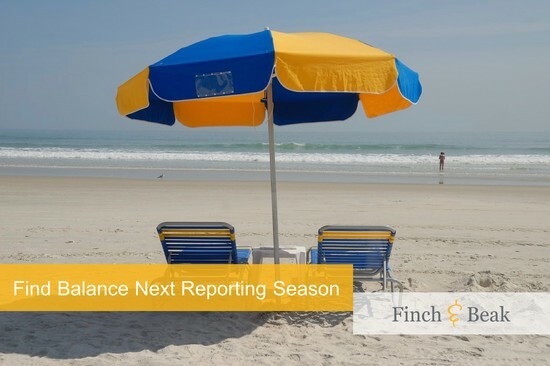 If reporting and benchmarking is increasingly restraining your calendar, we can help you create more focus and get more value out of your reporting efforts. Please contact Josée van der Hoek, Director, at josee@finchandbeak.com or +31 6 28 02 18 80 to find out how Finch & Beak can help you make more impact with less effort.